Jem Finer is a UK-based artist, musician and composer; and a founder member of the Pogues. Since studying computer science in the 1970s, he has worked with photography, film, experimental and popular music and installation. On 1 January 2000, his musical composition ‘Longplayer’ began; a piece of music designed to last 1000 years without ever repeating itself, and exists in both computer-generated and live versions. Between 2003 and 2005 he was Artist in Residence in the Astrophysics Department of Oxford University. 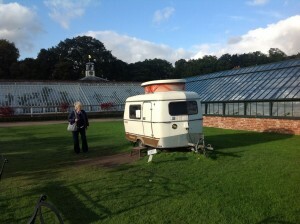 He was part of the recent Tatton Biennial with a number of works, including ¡Arriba! – a bantam caravan with windows replaced by LCD screens, with room for four people to take a ‘flight’ into the crazy, pseudo Dr Who cosmos.